I am going to list out ONE watch a week, and it will belong to a doctor, cannot name the owner, but I can vouch for the authenticity and value. That is what I do anyway. 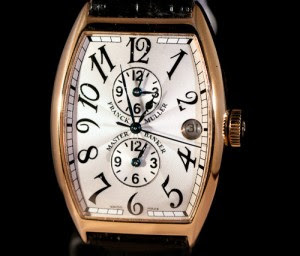 The FIRST watch that I have been asked to sell away, is a Franck Muller solid gold Master Banker, brown strap, more than 10 years old. I will post up pics asap. One doctor owner, a woman, small scuffs etc...asking $12,000 sgd...all box and papers are in...but box is bad condition, with black rubber parts all mashed. I will say the price is GOOD..not bargain, but GOOD, because I know that the watch is well looked after. It looks like this, but this is not the actual watch.